CFO to CEO: What if we spend our time, money and resources in training/developing our employees and they leave? CEO: What if we don’t spend anything and they STAY???? This little dialogue says volumes in itself! Being the most valuable asset of the business, ‘employees’ need time, material and resources to evolve and somewhere down the line, this evolution is also directly proportional to business growth. In lieu to this, corporate training can turn out to be a beneficial investment for any organization. Providing corporate training to the employees can prove to be a useful method for enhancing their capabilities and existing skills. What you need to know about Corporate Training! Corporate training can take place through in-house technical training, out-of-town seminar, online learning, personality development practical, etc. and is said to be a working part of HR strategies. It reflects the organizational goals and ethics of a company i.e. the way a company values its resources and takes effort in making them more accomplished is visibly reflected in its corporate training. The best way to ensure a learning environment for your staff is through allowing a corporate training company to help your organization. Know the best 7 impacts that such enterprises can make on your team and organization. 1. It will improve the performance of your company: Skilled workforce is the driving energy of success. Corporate training will not only brush the technical knowledge of your employees but will also make them highly competitive and competent. It will raise a good deal of professionalism in employees. 2. It will help you in achieving the best of organization’s objective: Success is the core objective of any business and through corporate trainings; one can strategically plan the development of employees to ensure growth. 3. It will make you ‘Future-Ready’: Since change is the inherent law of nature, especially in the world of business, it is important to have a future-ready mindset. Updating oneself as per the technology or prevalent market trends through training is the need of the hour. 4. Skill Development is a reward: Probably, the best reward that you can give to your employee! To an employee who is giving you the best of his/her time, imparting training is nothing but a rewarding gift. 5. 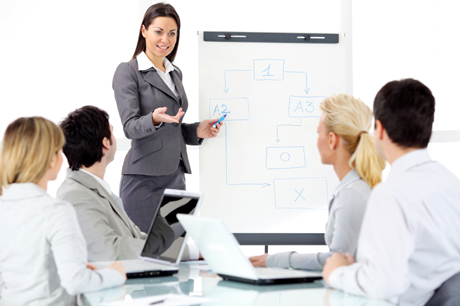 The best corporate training in the industry: Undeniably, a professional service for corporate training will help you in getting the best learning experience. Since these companies are quite regular in providing training services, their degree of professional understanding and expertise is remarkable. 6. A quick boost to the confidence of employees: There is nothing more valuable for an organization than employees who are inherently motivated. Imparting corporate training with the help of a professional service can be the best reward for the confidence building of employees. 7. Help you in learning the effective management of time: Better development of skills mean better ways of time management. A skilled employee knows the secret of effectiveness, and this is all that a business needs for being successful. All thanks to some corporate training companies for understanding this!